The Bumbo seat is something that almost any expectant mom has heard of. You can find them on almost any baby registry. So what is all the hype about the Bumbo Seats? As a new mom I decided to do some research before I purchased the Bumbo! If you Google around you will see many different opinions on the Bumbo seat. I of course looked at different physical therapist opinions. All of these therapists have very valid points. One of my favorite posts is from Mama OT’s blog. This post makes great points and goes into detail on how a Bumbo Seat can be developmentally inhibiting. I would encourage you to check out the post. 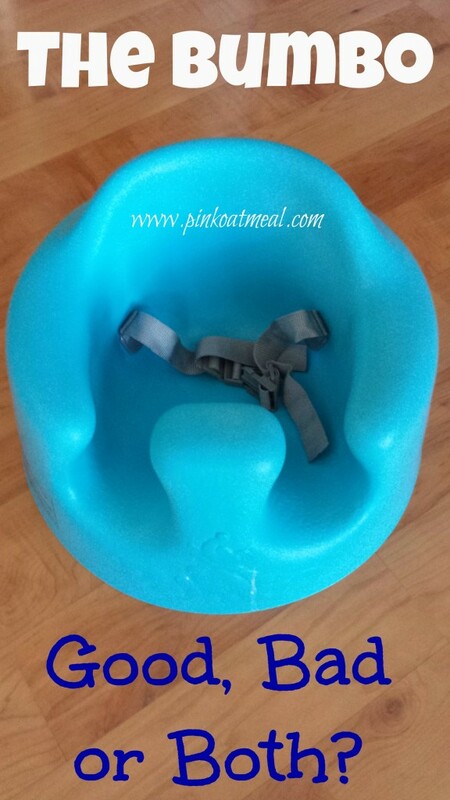 It wasn’t until I was pregnant and doing my own registry that I came across another post about the Bumbo Seat from Kendra The PT’s blog that discussed how the Bumbo seat could be effective if used properly with the right child at the right time. It also made some great points. I encourage you to check it out. Ultimately, I decided it probably wouldn’t hurt to put one on my registry. If I got one great I could try it out for myself. If I didn’t get one no loss. Well I got one and here is my two cents on the seat as both a physical therapist and a mom. 1. I didn’t get to use it as early as I thought I would. I don’t agree with the statement on the Bumbo Seat website “As soon as your baby can hold their head up you can seat them in the Bumbo Floor Seat.” I just think this is too early. 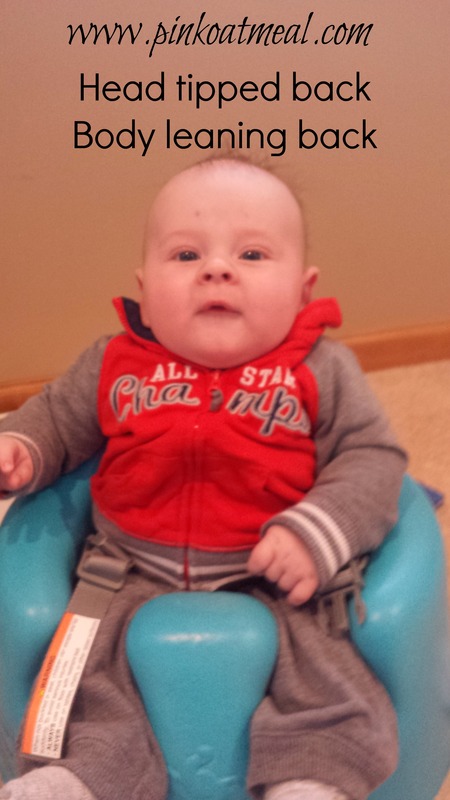 Here is a picture of my little guy in the Bumbo Seat. He had plenty of head control when on the floor but his position looks terrible in the Bumbo Seat. Even with good head control, he wasn’t ready for the Bumbo yet. Baby can not maintain good positioning in Bumbo seat even when baby demonstrates good head control. 2. My little guy has quite a bit of chub to his legs. I really had to shove the legs into the Bumbo. As a mom I just didn’t like that. I would suspect that there are some babies who can’t even ever get their legs in them if they have even more chub. I would also suspect there are babies who fit in them just fine. 3. There was a short period of time where I felt that my little guy looked good when placed in the Bumbo Seat. I felt like at that point he had sufficient trunk control to hold himself up nicely with assistance for the seat. It was that time period where he wasn’t quite able to sit independently on his own. I used it mostly for taking pictures and occasionally if I was somewhere that I needed him upright for a couple minutes and floor time wasn’t an option. It seemed like very shortly after that he was able to sit independently so there really was no purpose to the seat. The time that the seat actually seemed usable for me was so very short. 4. It then brings back up the issue of it being a device that limits any kind of movement. That means that I didn’t want him spending excessive amounts of time. I like the rule of 2 and 15 and tried to follow it as best I could ( I wasn’t perfect!). That pretty much limited my time at to 15 minutes per day for 30 days (that was as long as it was useful at our house). That is a total at the very most of 450 minutes or 7.5 hours at the absolute maximum. Just a different way of thinking of it. I don’t hate Bumbos, I just didn’t find it overly useful for the cost due to the short time period. In my case, I could have put something else on my registry that likely would have been more useful. I believe for some, they may be useful in moderation, especially if it works for them to use it for longer periods of time then it did for me. Instead of the Bumbo, I let my baby play on the floor. 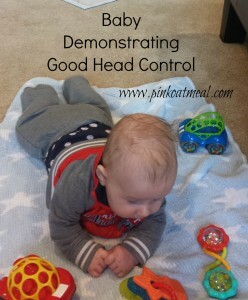 The floor is the ultimate option for building their motor skills and for working on their head control. Need some ideas for tummy time and ways to make it fun for baby and not a chore? Check out my tummy time resource guide! Sometimes I needed to put the baby down and the floor wasn’t an option. I used the bouncer seat, diaper box or laundry basket. I waited on the diaper box and laundry basket until he was closer to being able to sit independently. Baby carriers- This one was a great option for hands free. Here are more great Bumbo alternative suggestions! Hi Chanda! I found your blog this morning through a Pinterest post and was intrigued. I’m a PT also but I have been specializing in geriatrics and long term care. I’m currently pregnant with my first baby, my little boy and am at 19 weeks. I’m really interested in doing all I can as a PT to help his motor development after he is born and have been trying to look for resources, text books, whatever I can find to help me know how to position and what to do and what products to use or not use etc once he is born to promote the best development. I love all of your PT posts and regular posts and find them very helpful and I will definitely be reading from now on! As a pediatric PT, do you have any suggestions for books to give me a refresher on infant motor development and positioning etc? My peds course in college was really a joke and I feel like I have nothing. Any advice you could give is greatly appreciated! Your son is adorable! Thanks so much! Hi Megan! Congrats on your baby boy! I’m so happy you found my blog. I was originally an orthopedic therapist (still do it on the side) but have been in peds for the last 3 years. So now I guess I have been in peds as long as ortho! Anyway, so much of my learning was literally on the job and from others and actually from social media/blogs and being able to apply them to my practice. Mama OT (see link to Bumbo post above) actually told me about a book that she just went through called Retro Baby (google it) that talks about cutting back on gear and gives activity suggestions but also is not an end all be all book. I’m very intrigued by this book and plan to get it myself. As a physical therapist there is the ideal world but since I became a mom I know there is the real world too so I like the approach her book takes. Feel free to contact me with any questions! Hi Chanda, thanks for your nice post. I like your description of how long you used the Bumbo seat and your photos of your handsome guy are great! Tummy time builds the connection between the inner core muscle team and the outer core postural synergists, when it is developmentally appropriate, not to mention contributing to the development of the babies’ brain map of their body, through sensory input. Thanks for stopping by and reading! I love how you summed up the benefits of tummy time so nicely I wish I could have done it that well 🙂 ! I’m hoping that blogging about “baby things” and tummy time advantages will help educate others! The bumbo seems to have a window of about 2 weeks of usefulness between the babies needing more support and when they can sit on their own. Not worth the money for that. On the other hand I did just recommend using it for a boy with Down syndrome that will likely be working towards independent sitting for a longer period of time than other children. hi, i use the bumbo seat for my 7 month old. he has started to eat solids but doesn’t sit up very well… he leans so far forward to where he is almost kissing the floor. he has great control and balance. he gets up on his hands and knees (even rocks back and forth). he just prefers his tummy. the bumbo is the best way for us to get him to sit up so he can try out some solid foods. that being said we are not using the seat to teach him how to sit up. we started him on tummy time when he was 3 days old… so we think he just prefers to be down on his tummy. he’s going to crawl soon so we know sometime along the way he’ll sit up all on his own. i also feel like stating that we are clothe diapering, so the diapers are far more bulky and it definitely is harder to get him in the seat. i found just pulling the seat open more at the leg opens… helps my babies legs drop down into place. i hate this the most about the bumbo but my son doesn’t seemed bothered/ hurt by it. we only plan on using the seat until he can safely sit in his highchair without needing to lean so far forward. I am a pediatric (EI) PT, too, and only recommend the Bumbo for kids with plagiocephaly to help them get the pressure off their heads until they build up tolerance to tummy time and can sit independently or with a Boppy. I still limit it to no more than 30 minutes total per day. I never tell a family to go buy one though, only if they have it already. With the new study on the ineffectiveness of helmuts, this may become more important. Thanks for stopping by! 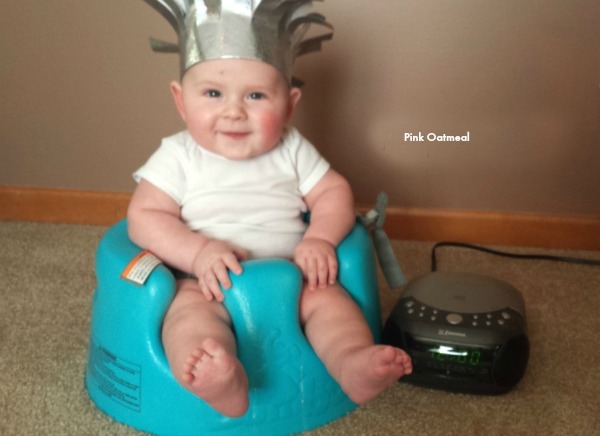 I love hearing how other people use the Bumbo Seat and prescribe it! It sounds like most therapists are on the same page with limiting time if they decide to use it! I’m going to check out the new study on helmets! My granddaughter used the Bumbo intermittently for about 30 days. She longest she would ever stay seated was 15 minutes. I think it works well for some babies, but for other babies, the use time is just so brief. I agree! The time of use that was appropriate and for such short bouts wasn’t worth it for me. I’d rather purchase something that would be useful for far longer! I am a pediatric PT and a mother of a 2.5 yr-old. I have a few Bumbos that I loan out to some of my families, but I agree they are not that useful for most kids. I don’t like the anterior leg position it forces children into–definitely not ideal for learning to floor sit as the legs cannot be used properly to assist with righting. And, when I put my own kiddo into one, I think around 4-5 months (he started sitting on his own at 5 months) he would spit up from the pressure of the pommel, and again, I think because he could not use his own legs properly to assist with balance. I watch my niece while my sister is at work. I was given a hand-me-down Bumbo. Like you, I didn’t feel she was stable enough at first. The she didn’t like it. A blink later and she sat by herself. She is 6 and a half months now. She has started to eat and I don’t have a high chair for my house yet. So the Bumbo is finally getting some use! Basically it is just a way to restrain her while I’m feeding her. The Bumbo I was given comes with a tray, so this will probably be my solution for a few months. Omg ! Finally someone says what i am trying to say. My friends all have bumbo seats and then THEY PUT IT ON THE DINNER TABLE AND WALK OFF !!! Or they put it on the couch. When i try to explain it they just look at me like i am the one that is stupid. I have stopped telling them they shouldn’t leave it in there for hours at a time in front of the tv but I can’t keep quiet much longer. I see jumpers walkers and bumbo seat and i just think it is so sad ! I just wanted to share my experience with my Bumbo, and my Prince Lion Heart seats. When I had my oldest it didn’t get much use because she had chubby legs. Fast forward 3 years and my son was about 6 months old these seats really helped me out. We all know the age where they can kinda sit up but not really. During these times we took it with us to restaurants for him to sit in and I used to when I went to the grocery store. I would set it inside the basket and my 3 year old would sit in the seat in the cart. While I don’t think they should be used for smaller babies it was a tremendous help when he was a bit older and I needed him to sit up and not keep falling over. Good morning, my baby is 8months old now but can’t sit on his own. He can not hold anything, he can’t stand. Please what do I do? It should never be a substitute for the importance of touch and holding your baby – use with caution; personally I would never purchase one. Also, caution around screen time. Again, not a substitute for human contact. The negative impact on screen time for infants and toddlers is being noted widely in the research tied to an increase in concerns around speech and language delays and social communication concerns.